This paper presents a tool suite (made up of two previously unrelated approaches) for the engineering of multimodal Post-WIMP Interactive Systems. The first element of this integration is ICOM (a data-flow model dedicated to low-level input modelling) and its environment ICON which allows for editing and simulating ICOM models. The other element is ICOs (a formal description technique mainly dedicated to dialogue modelling) and its environment PetShop which allows for editing, simulating and verifying ICOs models. 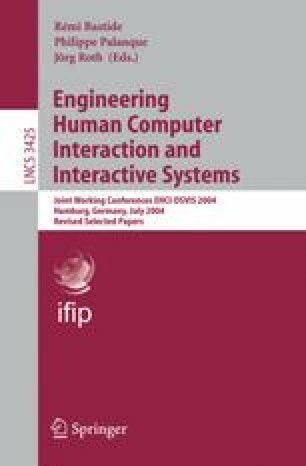 This paper shows how these two approaches have been integrated and how they support multimodal interactive systems engineering. We show on a classical rubber banding case study how these tools can be used for prototyping interactive systems. We also present in details how the changes in the interaction techniques impact the models at various levels of the software architecture.